Copyrighted material by Kerrie O'Hearn Marquart may not be copied without permission unless otherwise indicated in my posts e.g. blog links or craft directions. Thank you! Due to changes in Google, they are deleting my blogs. Pls. visit KERRIE'S KRAFTS blog for more information. Thank you. My, where does the time go? Busy, Busy! I have been working part time and enjoying that. 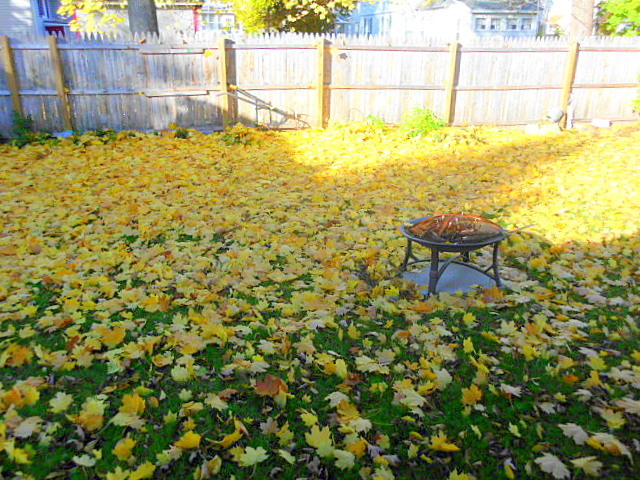 I am so busy with church activities, gardening in the nice weather and now 'tis winter in full swing! Here are some photos to bring you up to date since my last post. While playing basketball with my boy friend John and his neice and nephew, I broke my finger. But I actually have improved my bone density from doing this (weight bearing exercise) and no longer take meds for my bones! Hurray! 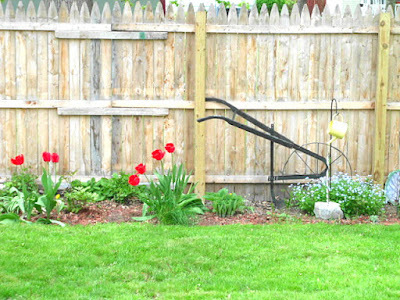 Below is my backyard flower garden with antique hand plow. 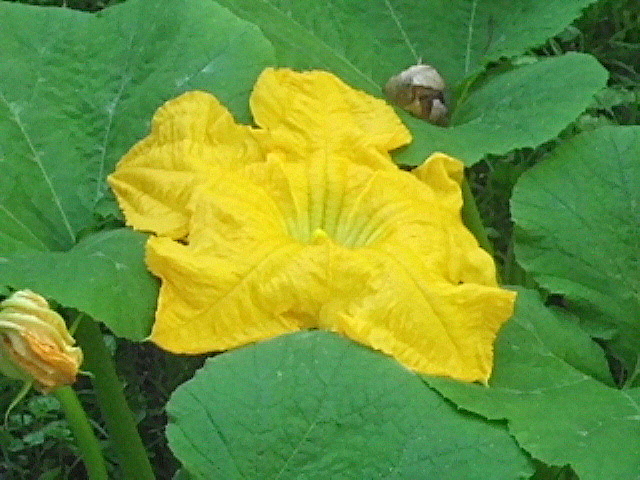 Above, my pumpkin vine with a blossom as large as a dinner platter! 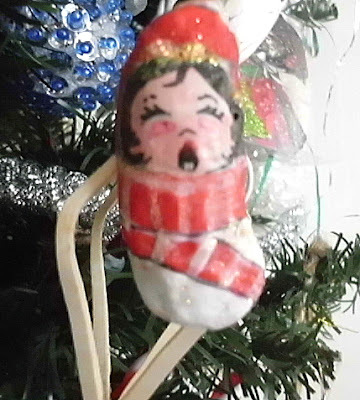 And it was time to trim the little tree again with all my handmade ornaments of yore. 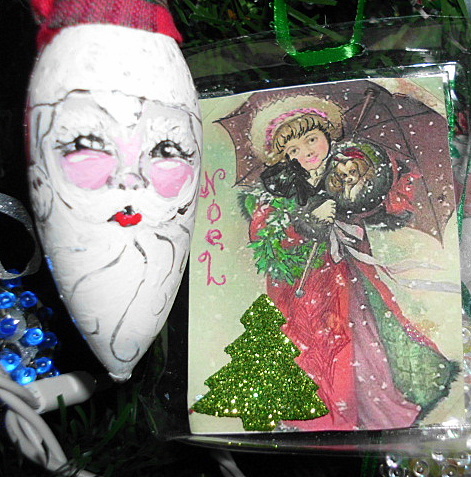 A Santa from a flame bulb, a vintage card print in plastic packaging and below a cute little Caroler I painted on a Cat's Paw Shell. I love them all and they bring back so many memories of Christmas past. May you have a most blessed New Year and thanks for coming. Ya'll come back soon! Beautiful Sunsets at the Yacht Club on Owasco Lake. The building of my new front porch. 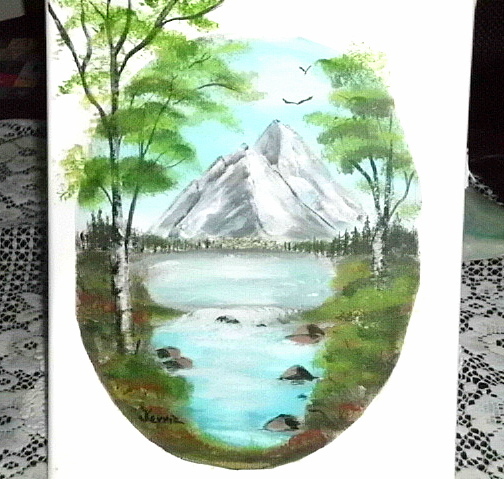 Gave this one to John for his Birthday July 16th. Another one of my hobbies is finding fresh water fossils. I found this snail shell near the parking lot at the club. 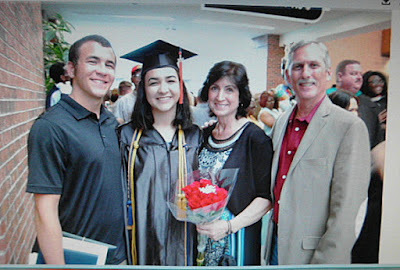 My wonderful granddaughter Rosemary who graduated from H.S. AND College one week after another! Brother Seth (2nd year Clemson U, SC to her left), Mom Christine and Dad Jim. 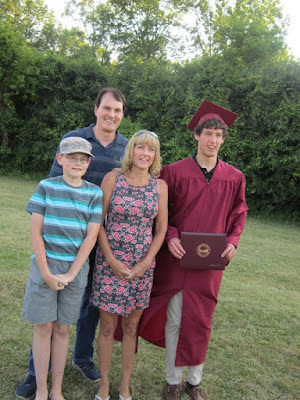 The programs they provide to High Schoolers now are wonderful! The last 2 yrs. 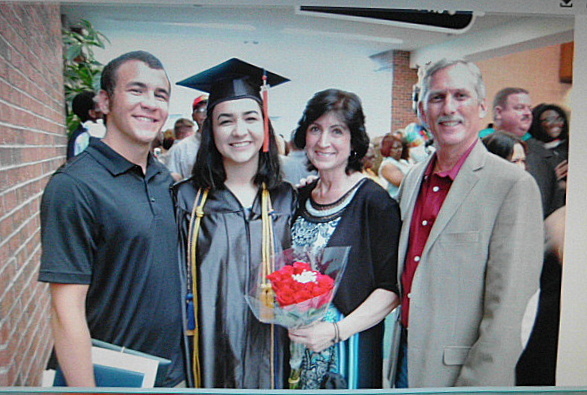 of High School, both of the grandchildren attended College. AMAZING! 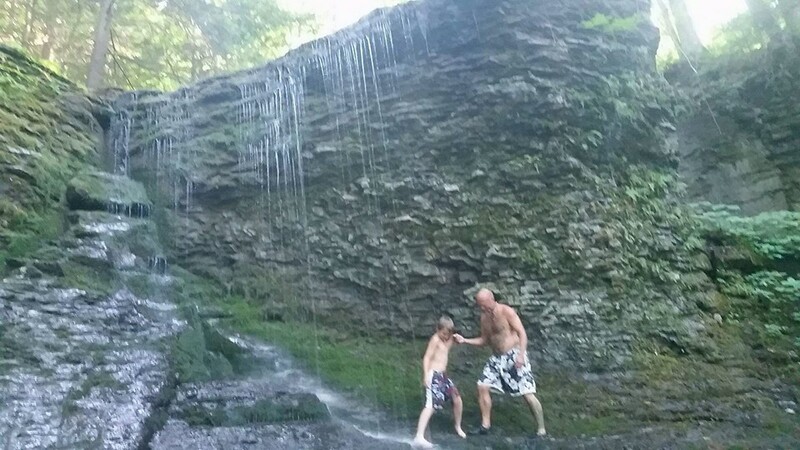 And last but not least a trip to Bucktail Falls with John's Nephew Carl and Great nephew, Tim. They took a shower in the falls and that water was cold!! What have you been doing this summer?? Thanks for visiting and do come again soon. 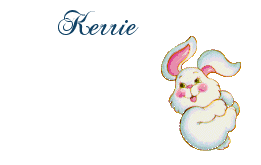 Check out my http://kerrieskorner.blogspot.com for a new post there as well and I will be ending this blog soon and will only be posting on the other blogs. to see what others have posted! Good Morning to you! 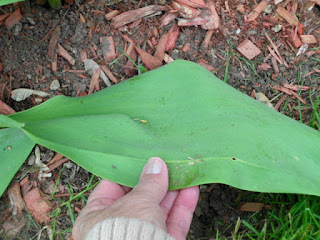 I have been remiss in posting on this blog due to illness and just plain busi-ness! I have 5 blogs at present as you can see in my sidebar. 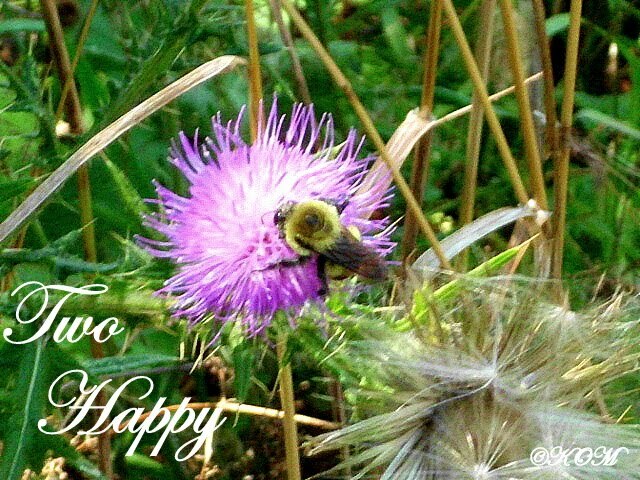 This is my original blog and my hubby was alive then thus "TWO HAPPY" was created with love. 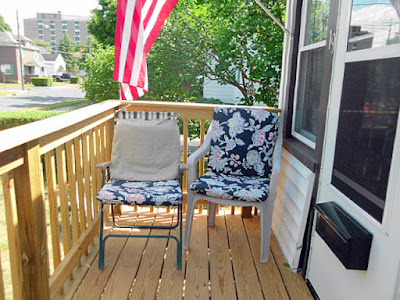 My Bill has been gone 4 years now and I moved back to my home in Auburn NY after 28 yrs. in South Carolina. I would like to thank all my faithful followers through the years on this site, you blessed me with your visits and comments. 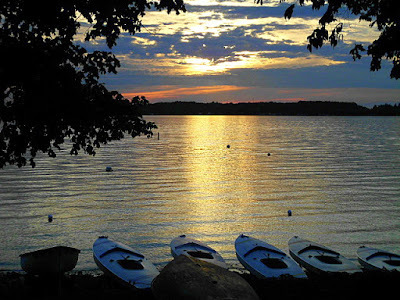 I will be discontinuing this blog soon but please leave a message in the meantime ~ I would love hearing from you all! I moved my refrigerator a few days ago and gave myself a hernia! Rest and alternating ice and heat per ER doc so a perfect opportunity while recuperating to bring my other blogs up to date. Meantime, I have been working in the garden as Spring has finally arrived and even planted 2 grapevines. Life is good, God is good. Last fall I finally got the back fence in to complete a total fenced in back yard and the privacy is wonderful! 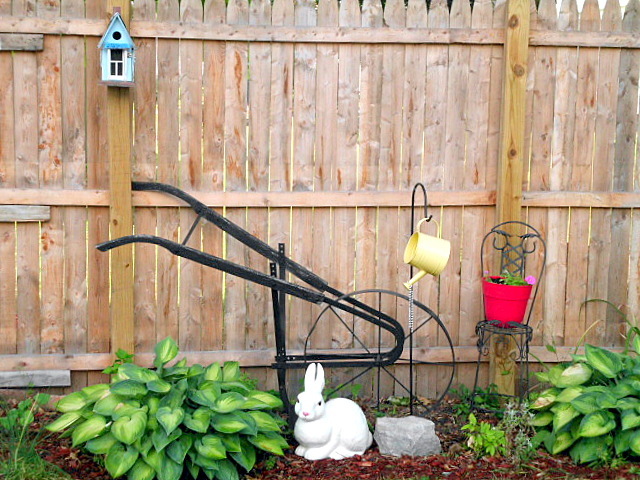 My cousin Kathie gave me the vintage hand plow and I gave it a coat of black paint. 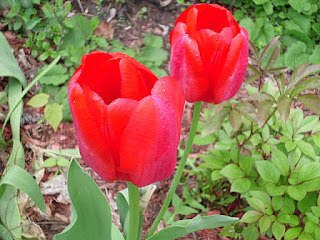 The Tulips are huge this year! She also gave me the forget me knots in front of the plow. Even the leaves are huge! I will have fun visiting all of your blogs and catching up. Amazing how fast life goes by the older we get. 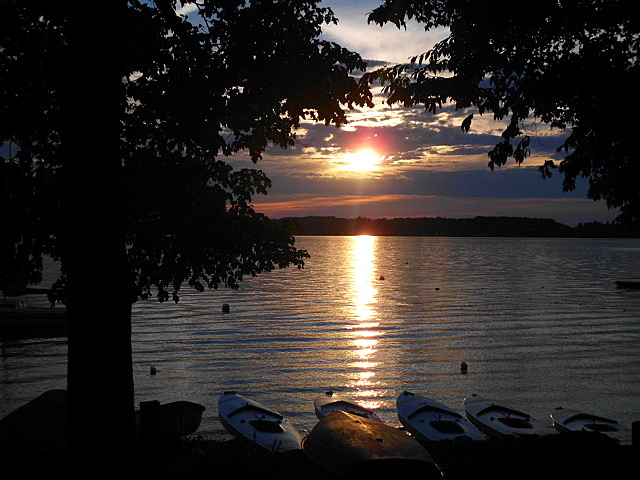 Blessings and hugs to all of you. Do any of you share my addiction for changing the furniture around? My friends always say, "again??" But I am finally at an age where I feel comfortable arranging things that are most comfortable for me when walking and working around the house. 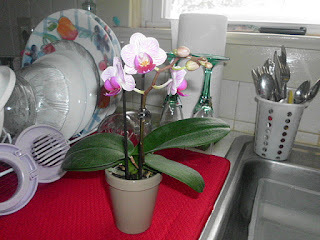 One of my pet peeves is having to walk around the dining table to get to the kitchen-ha! So I took it away from the center of the room. I also like furniture on angles as you will see :) I am hopeless-ha! I would never ever merit Home and Garden magazine-ha! 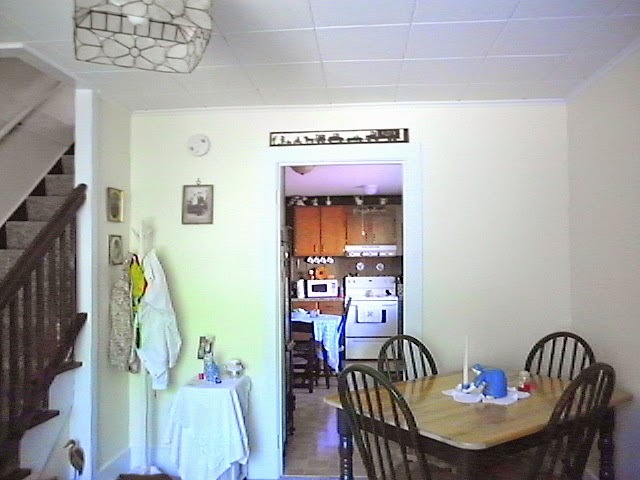 Looking toward the kitchen doorway. 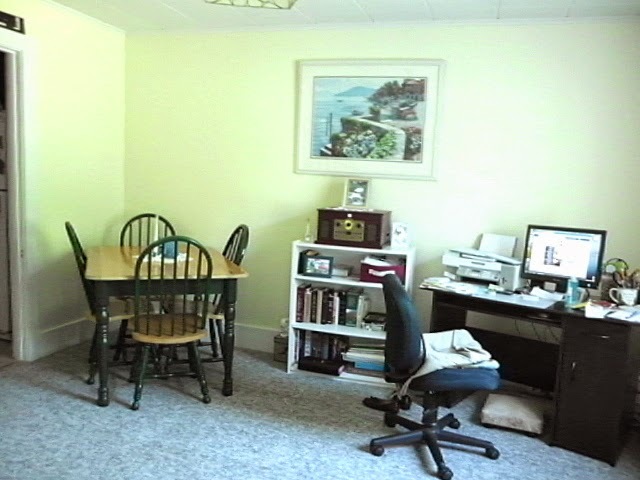 The little corner to the left did have my school desk there but that is in the opposite corner now. 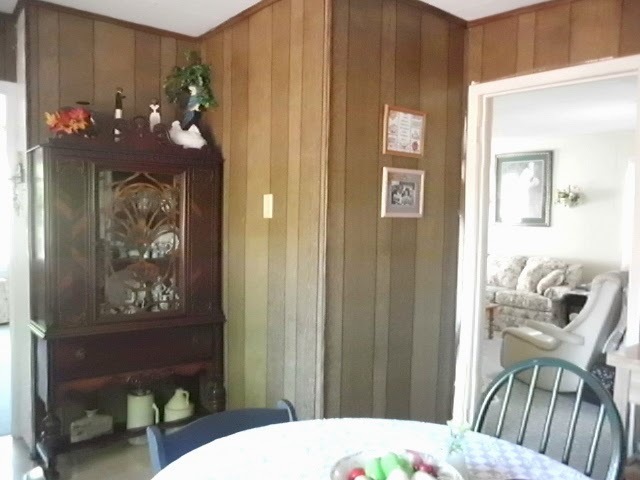 Since the dining area doubles as my computer room, I also put my desk on an angle and can see out the dining room window. 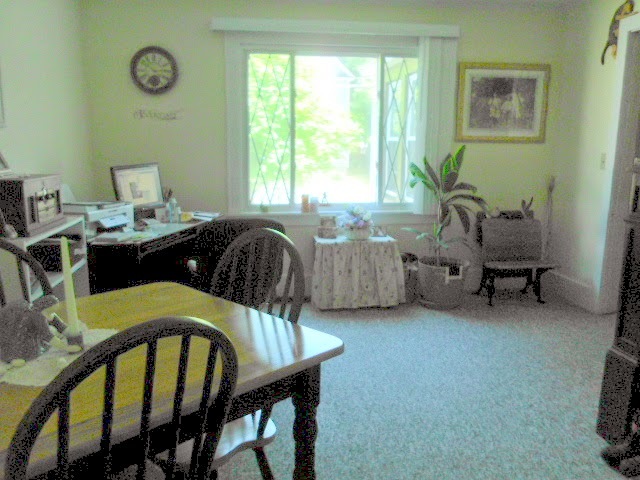 It is a nice bright area. 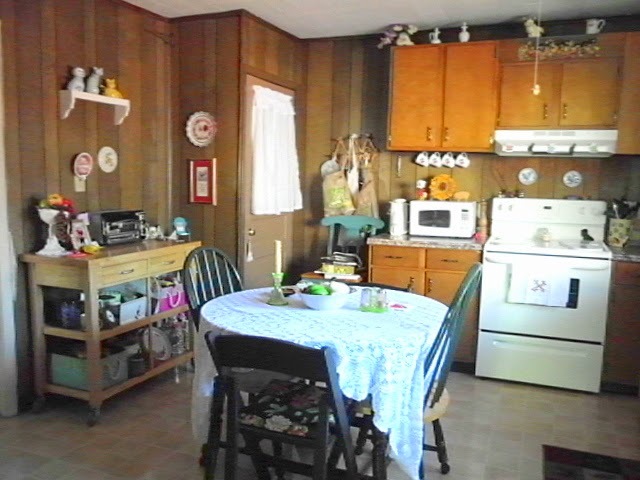 Looking toward the dining window and a close up below of the corner with the school desk now. 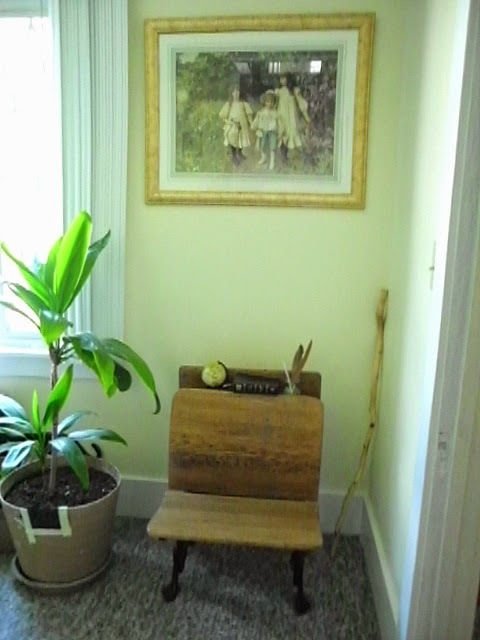 I love my vintage school desk that my hubby Bill bought for me in Bennington, Vermont on one of our many visits there. I also love the print of the children over it. 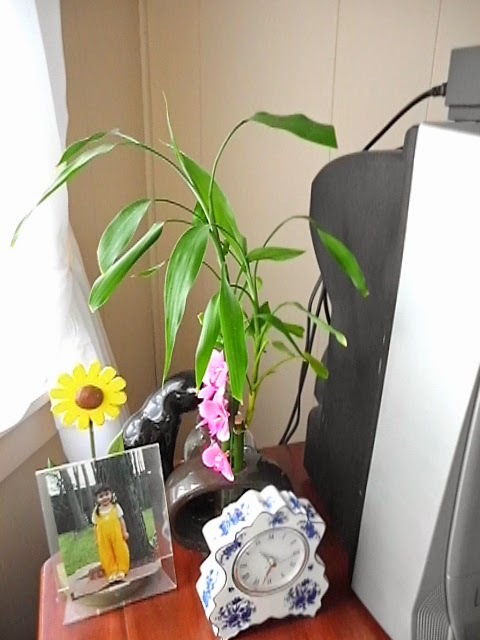 The plant to the left of the desk is my Tai plant that I have had for 55 yrs. My hubby bought the waxed root for me at the New York State Fair when we were dating and though it has been broken off and thought dead several times, it always comes back more beautiful. The pot however is in bad need of replacement-LOL! Pardon the tape-ha! The China closet may also end up being on an angle in the corner, too. Thanks so much for visiting me today. I would love to hear from you in comments. Come back soon! Hi there my dear friends! Sorry that I have not been posting but I fell down my cellar stairs backwards when letting the dog out the back door. Long story but I sustained a concussion and bleeding in my brain after hitting a large pipe on the ceiling of the cellar when I was falling. I crawled up the steps unable to focus my eyes and vomiting and from my medical training, knew I was in big trouble. Bleeding profusely, I walked next door holding a kitchen towel on my head and my neighbor took me to the ER. I had 8 Staples in my wound that was cut to the bone and then transported to Upstate Medical Ctr. with the brain injury not knowing if I would have to have surgery. After 2 more CT scans there of my head, it was determined that the bleeding in my brain had stopped and that it would dissipate of its own accord. No one could believe I did not lose consciousness and walked next door for help. I know that God was with me from the moment I fell and that because my neighbor and I prayed holding hands that I did not have to have surgery. I could have broken my neck or bled to death. God does answer prayers and you would not believe the blessings that have come to me because of that fall. Our Lord is so good! So I am taking it easy and healing slowly. And I will be posting again soon. Love you all who are my followers, you make my day! 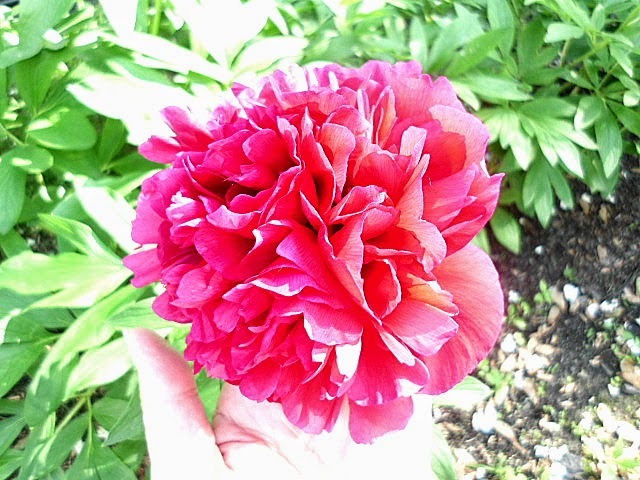 One of my beautiful Peonies lining my driveway. 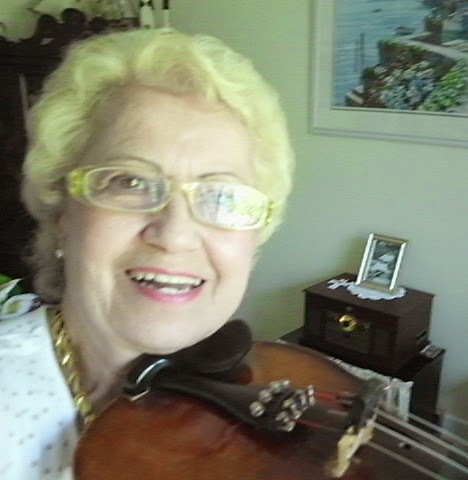 One of the blessings is that since I cannot get into much of anything physical at present, I have been playing my violin to get rid of the rustiness I was experiencing with it. A few Irish tunes and I am back in the swing-ha! Thanks for coming today, have a wonderful day! Ahhh! 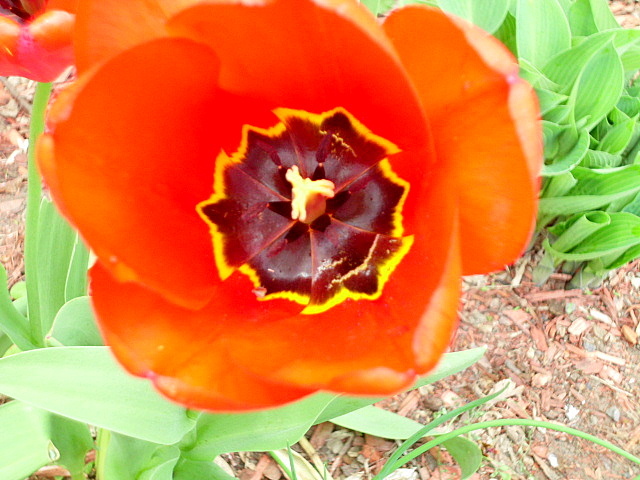 Spring is really here! 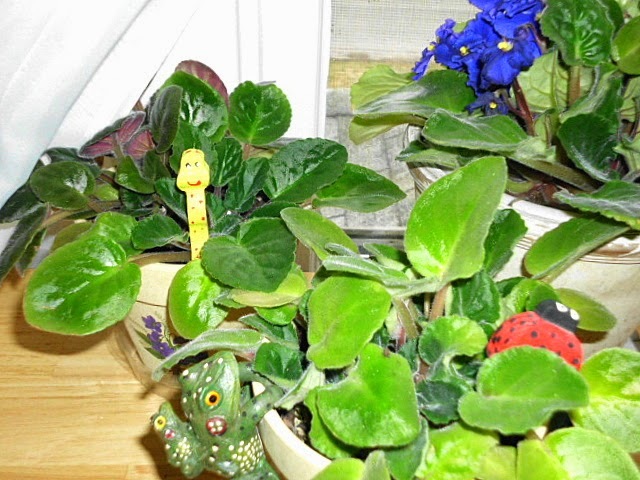 Fluctuating temps from 70's to 37 and back up, Rain and Sun but Everything is greening up and my sun porch is warm enough to put my plants out again! They have been wintering in an upstairs bedroom window . I took the photos before they moved to the porch-ha! This is a Lucky Bamboo Plant that was given to me after Bill's passing and I have had good luck with keeping this one so far. 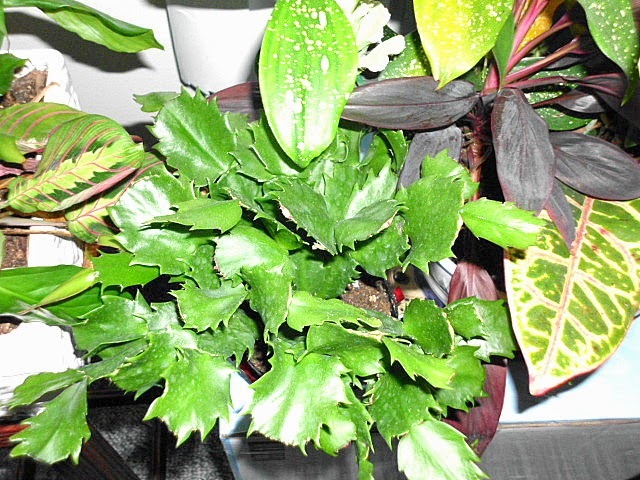 This is a Christmas Cactus with others in the background. 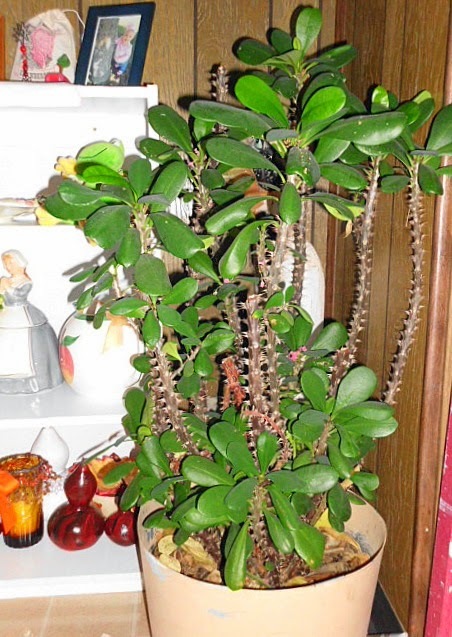 This is a crown of Thorns plant that my Mom started for me many years ago. 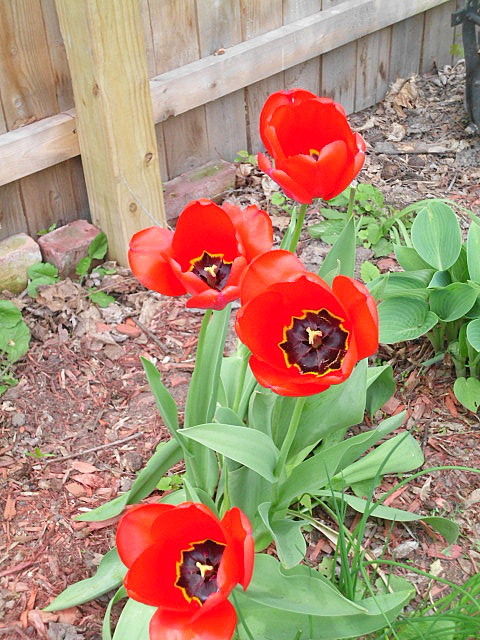 It is over 3 feet tall now and has beautiful Red clusters of flowers. It is said to be the thorns twisted into the crown of Jesus and the red blossoms are the drops of blood. 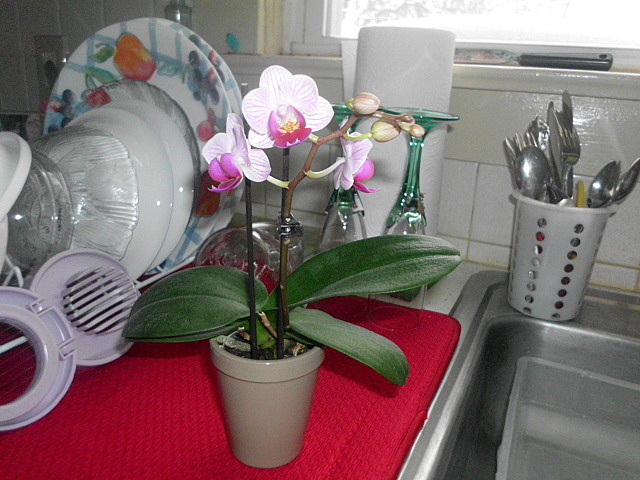 It has been wintering in my kitchen and not blossoming prolifically due to lack of sunshine. 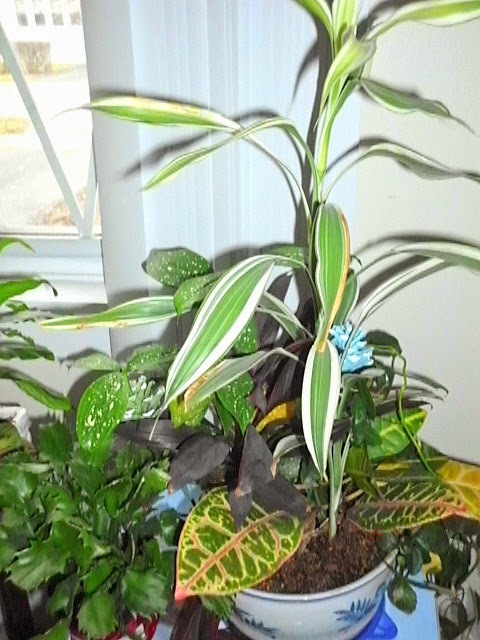 This is a beautiful multiple planter that I received from my oldest daughter for my birthday in March. 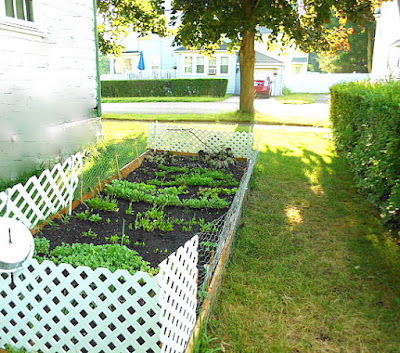 This is another planter that was sent to me at Bill's passing by my Brother and his wife. It has really grown. 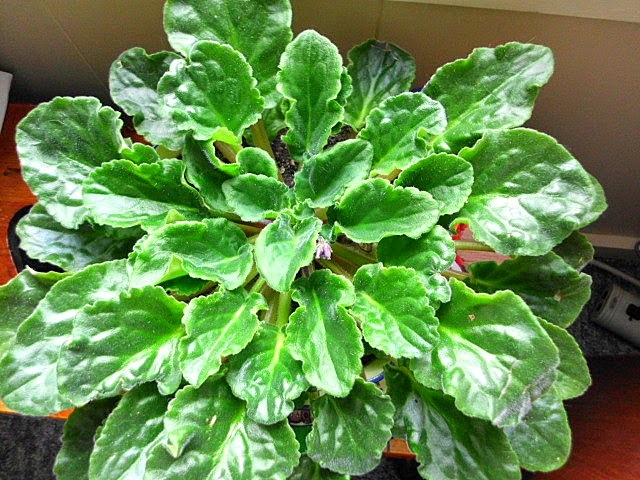 This is my favorite plant and will be 55 yrs. old this fall!! 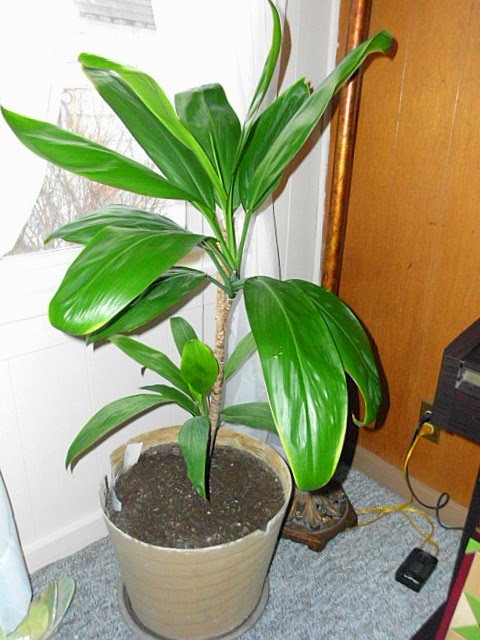 it is a Tai plant from Hawaii that my husband bought for me at the NYS Fair when we were dating. It was only a waxed little log when he bought it and it has flourished through the years despite being broken off several times when the kids were little. It always comes back strong and survived moving back to my home town after a week in a moving POD in the heat! 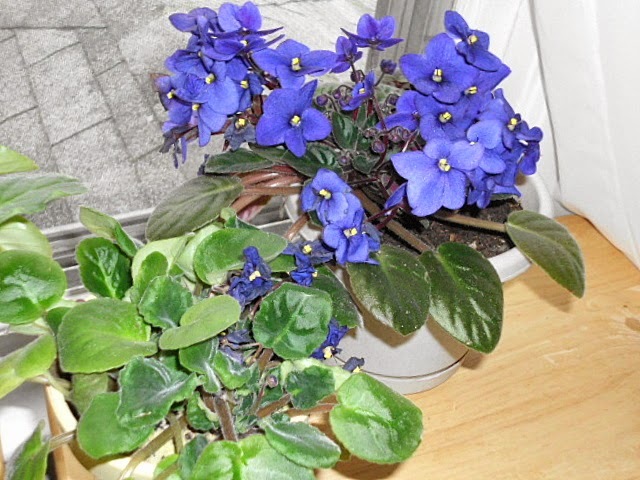 These are my violets that I started from leaves after buying the first one. 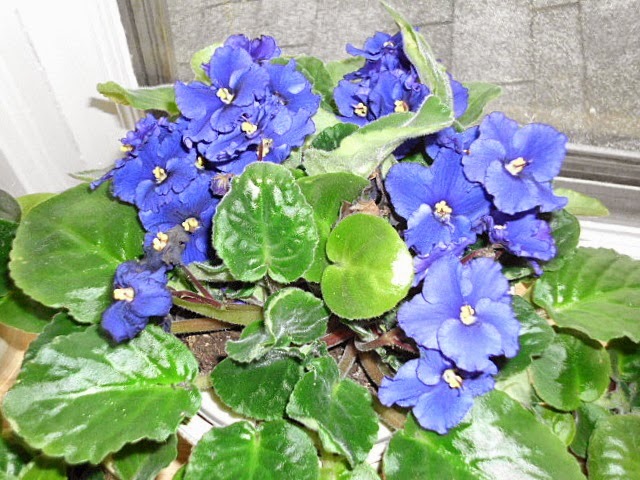 I am thrilled to find wild violets in my yard here, Snow drops, Tulips and Tiger Lilies! 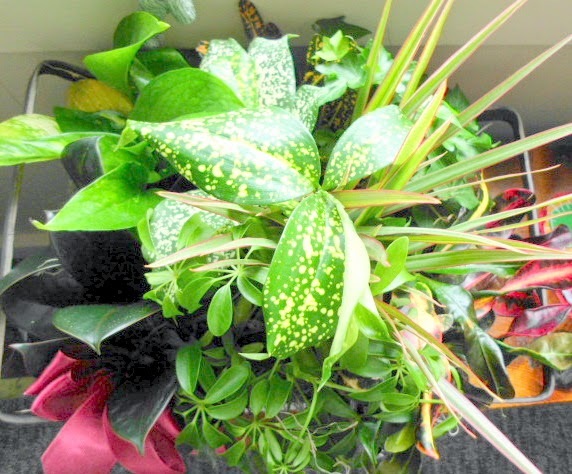 I love plants and flowers, can you tell? Ha! 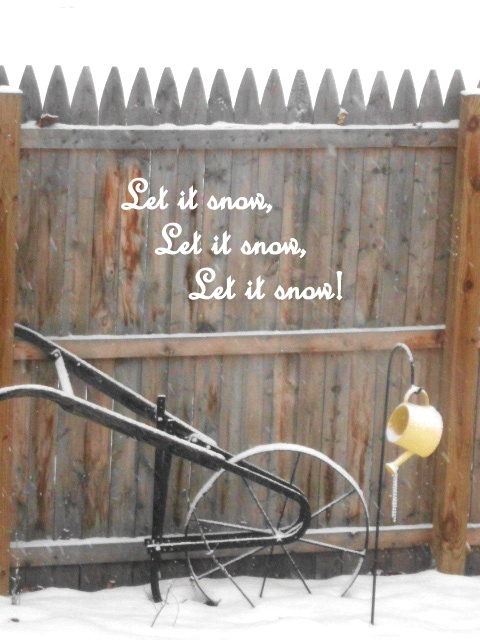 Right now it is snowing out but I know it will not last....famous last words! comments as I treasure them!